In the International Cities of Peace we have had extraordinary growth in terms of being able to help and mentor and challenge people within communities to build city of peace efforts. . .
We started with the idea of the city of peace which is an idea that is not only hundreds of years old, but thousands. Jerusalem, for example, means city of peace in Hebrew and Arabic. The concept of a city of peace is really inspirational. These cannot be taken for granted. I get emails every day from the Democratic Republic of the Congo, from Palestine, from Colombia. These people have a vision and a hope for their lives and for their children to create a peacebuilding operation in their city that will achieve safety, prosperity and quality of life. . . This is about Rotary because Rotary has such intense potential to create peace in the world. . . Every Rotary Club has this need and desire to create a better community . . . Rotary Peace Clubs are a huge benefit not only through the United States but throughout the world . . . International Cities of Peace fits in as a pathway to build stronger Rotary Clubs. . . . It’s a platform for inspiring community action, for creating larger peace within the community . . . and it’s a way for Rotary Clubs to connect to the global family where there are people in great need . . .
As of this morning we now have over 224 cities of peace in 50 countries on 6 continents. The last one this morning was Hyderabad in Pakistan which we just learned about over the past couple of months. 1. Get signatures on a Letter of Intent. . . It must be community-wide. The signature has to do with the culture of peace as defined by UNESCO and signing up for that. 2. Write a vision, mission, and goals statement for their unique community. We help them through that, engagig about 500 different people working with International Cities of Peace who serve as mentors for people around the world. 3. Send photos and captions of local peace events and we create a free web page for each of our cities with contact information. 5. Write a statement about the peace legacy of the community. Every community has a peace legacy, whether it’s teachers or artists. Our children need to know about the peace work that has been done in their community. It’s a rigorous process that people go through. The key word is “transformative.” The people who develop city of peace initiatives transform themselves personally. It’s a different way of thinking about the world. How can we create a culture of peace? . . .
It’s amazing how, around the world, some of these items are very controversial, for example, equality of women and men, democratic participation. They are literally at risk when they sign the Letter of Intent to create what UNESCO has said is a culture of peace. And, there’s Hindus and Muslims and Buddhists and Christians and Jews and all of the different religions. The UNESCO resolution did not address directly the cultures of faith, so what we added, when someone creates a city of peace they sign a document that says they are going to be inclusive and we use the Golden Rule as the moral ethic for creating a city of peace. It’s very inclusive of all creeds and religions and races and cultures. . . I want to tell a few amazing stories about International Cities of Peace and reflect on their connection to Rotary [for details, see minutes 19-23 in the YouTube broadcast]. . . . In conclusion, our goal is to establish 1000 Cities of Peace around the world by year 2025. Imagine the difference that could make in the lives of our 7 billion companions on Earth. By creating the global infrastructure of peace, the great challenges and issues of our time could be addressed locally through democratic and reasoned debate and action. The dynamic of top-down prescriptions for how to create peace has not worked so well. It is only through bottom-up, “in situ” peace building by citizens who know the needs of their communities that will foster the kind of commitment and compassion that will change the world… and change the world, we will. 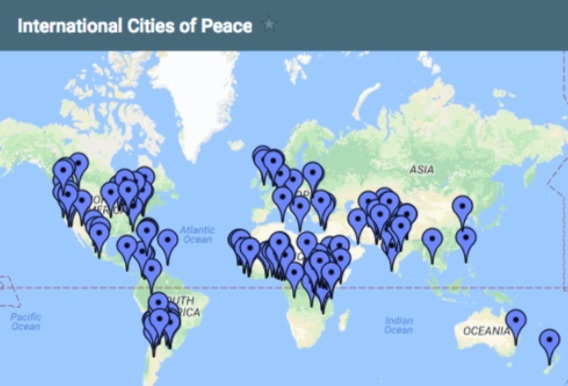 For more information on how to establish your community as an International City of Peace, send an email to info@internationalcitiesofpeace.org, or go to www.internationalcitiesofpeace.org for an easy-to-use web resource.